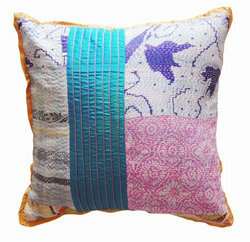 You are looking for beautiful handmade Raw Silk cushion cover adorn with Thread Work Patch Work . A beautiful handmade Raw Silk cushion cover. This piece has and Raw Silk on the front side. Made of Raw Silk it promises to last you long, without compromising on the quality and comfort that you so deserve. Fabrics for dress made ups, Pillow covers bed sheets and hangings made by the Pure silk fabrics..
Ambi Paired Silk Pillow cover is made just for you. Make your sleeping with this a wonderful experience as per its optimum softness. With the assistance of our well experienced professionals, we are involved in offering a quality approved range of Silk Pillow Cover. The offered range is made available in variety of sizes and designs. 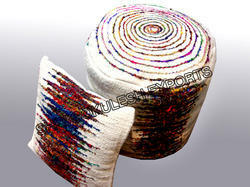 Moreover, the offered Silk Pillow Cover can also be tailored exactly as per the specifications laid down by the clients.